Industry 4.0 is the term given to the factory of the future and the shift toward using advanced technologies that are heavy on automation, data collection and connectivity. In this new industrial world, everything will be connected through the internet and the cloud, enabling factories to function as a system rather than individual parts. These connected devices will generate huge amounts of data that operators can use to make more informed decisions. Automation technologies will also allow human workers to take a more hands-off approach, although they’ll still be involved. Machine tools will become a part of this smart system. Industry 4.0 will change them in a range of ways and, through them, change the manufacturing sector. Here’s a look at how. By collecting this data, machines could estimate when a component needs replacement. For example, the system would alert operators to replace a bearing that has experienced a heavier load and more frequent use sooner than a less used bearing. This predictive maintenance could keep machines running more efficiently and prevent downtime. Manufacturing operations do not always use machine tools as efficiently as they could, and idle time is a frequent occurrence. For instance, research has found that machine tools are typically actively cutting metal less than 40 percent of the time and sometimes as little as 25 percent of the time. It can be difficult, though, to determine why this idle time occurs. 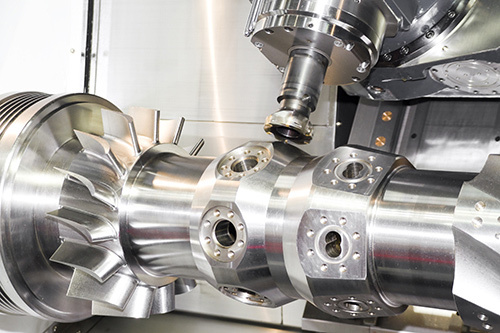 Collecting data on things like tool changes, program stops and feed holds make finding these answers more feasible and facilitate a more efficient use of machine tools. Smart machine tools and factories can also collect data on energy use to help save companies money. Internet of Things technology, the tech that connects individual devices via the Internet, is also showing up more often in the energy industry. Smart meters and other innovations help energy to flow more efficiently. A smart factory could use data on electricity demand to ramp up production when energy demand, and, therefore, the cost of energy, is low. Smart tools could also power down or reduce their power use when it’s not needed. Industry 4.0 will also help identify when machines are being used improperly. For example, if a machine knows the amount of force or temperature it can withstand as well as how the operator plans to use it, it can send out an alert if it detects conditions outside of that norm. This could help prevent misuse caused by human error or malfunction, which could avoid downtime as well as worker injury. Manufacturers spend a lot of time and resources on quality assurance, taking care not to let any faulty products slip through. The massive amounts of data that smart machine tools would collect about their use could help them to spot potential quality issues. If a machine operates in a way that isn’t typical, this will show up in the data. Operators may also even be able to track down any products that the mistake might have affected. The use of automation could also improve quality by reducing the natural variation that comes with human action. Human workers will not become totally obsolete, but such a drastic change in the manufacturing world will require a change in the roles they play. Many jobs will shift from physically operating machine tools to operating them via computers, monitoring data and providing oversight to automated operations. This will require some substantial retraining. Companies and workers should start now to avoid a skills mismatch further down the road. One benefit of industry 4.0 for workers is improved safety. The technology allows workers to stay further away from the machines and reduces the risk of human error when they do work directly with them. Getting started with IoT, automation and other industry 4.0 technologies can seem intimidating. It is wise to get involved where possible, though, to avoid falling behind the competition. To make the transition easier, manufacturers can start introducing advanced technologies a little bit at a time. This will be more manageable and more affordable. While starting small, companies should also develop plans for their technology adoption into the future. It’s also important to consider safety and cybersecurity. Manufacturers should also try to remember the goal they’re reaching for with their technology integration — better information, better decision-making and better results.